Oil lamps recall a different era but still retain their charm today. This replacement burner is still popular today in hand built pottery or as replacements in antique oil lamps. The burner is equipped to fit either a standard #2 oil lamp or to convert a mason jar with a 2-5/8" opening (edge to edge) into an oil lamp. 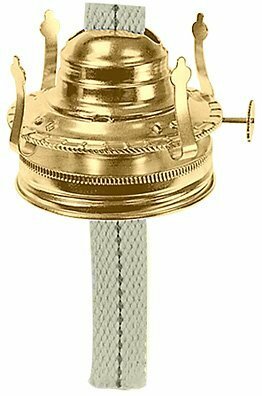 Plated in a bright brass finish over steel, it is equipped with a 6" cotton wick which is adjustable by rotating the wheel knob on the side. The burner will fit a glass chimney with a 3" base (not included). Simple in construction it is an inexpensive way to capture the mood of an earlier time. This offer includes 5 brand new replacement oil burners. If you have any questions about this product by National Arcraft, contact us by completing and submitting the form below. If you are looking for a specif part number, please include it with your message.